We’ve had great crowds of visitors this Columbus Day weekend, despite the first cold and rainy spell of fall. Time to break out the winter gear for our shop! A visitor took these pictures of Reliance which I thought I’d pass along–thank you Mary F. (The real boom crotch looks much better than previous support). I’m in the background talking to a young Naval Academy Prep School student and his family. Had several NAPS families come through over the weekend. Great “kids! !” Also had several students and families with Webb Institute connections. Fun to talk boat anatomy with all. 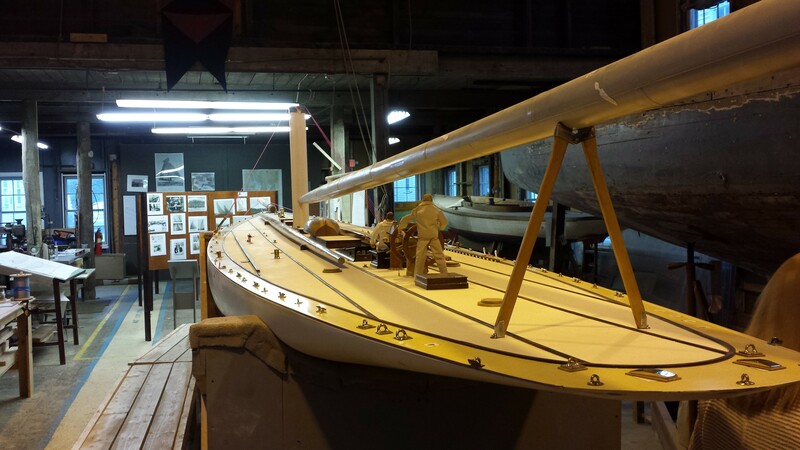 This entry was posted in Builder's Notes & Pictures and tagged America's Cup, Bristol, building 28, capstans, Columbus Day Weekend, Herreshoff, Herreshoff Marine Museum, HMCo, Naval Academy Prep School, RELIANCE, RELIANCE Project, RELIANCE Project team, Rhode Island, Webb Institue on October 14, 2014 by Herreshoff Marine Museum/America's Cup Hall of Fame. 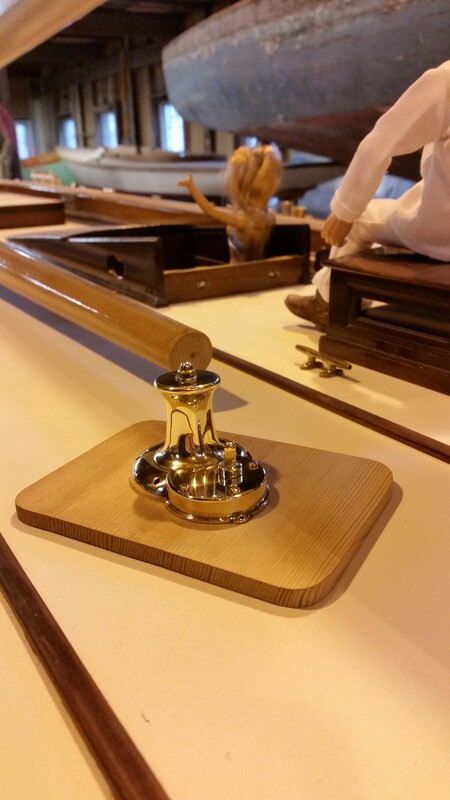 There is a lot of effort going on behind the scenes to make sure our RELIANCE is accurate. Boats, especially race boats, change during the season. We chose late August as our configuration date, when RELIANCE was measured and raced for the Cup, since this timeframe is when we had the best pictures. Ours has been a constant battle for configuration management. 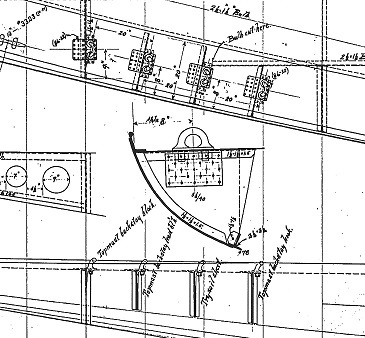 For example, NGH’s approved drawing 86-126 (from MIT Hart Collection) shows the original placement of three topmast backstay staples and a trysail staple as shown in picture #1 and as placed on our model as in picture #2. 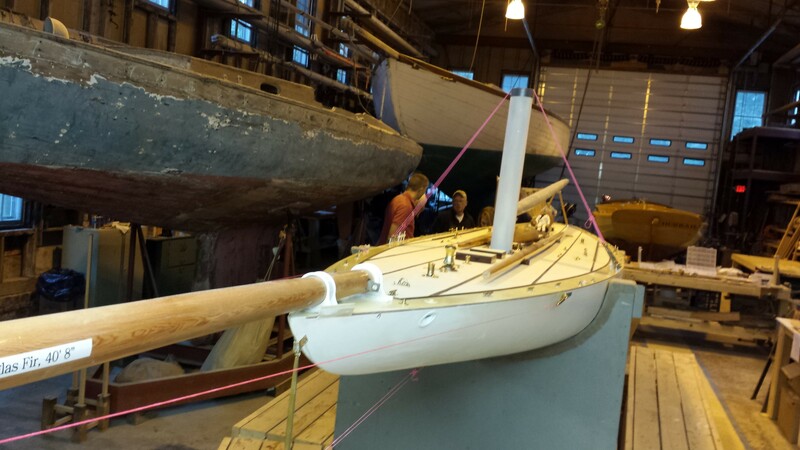 Our visit to the NYYC in NYC last Spring to see their model showed a discrepancy which was confirmed in picture #3 as blown up in #4. Our metal casting expert, Mike Mirman, then used this picture to created a new fitting, shown in #5. 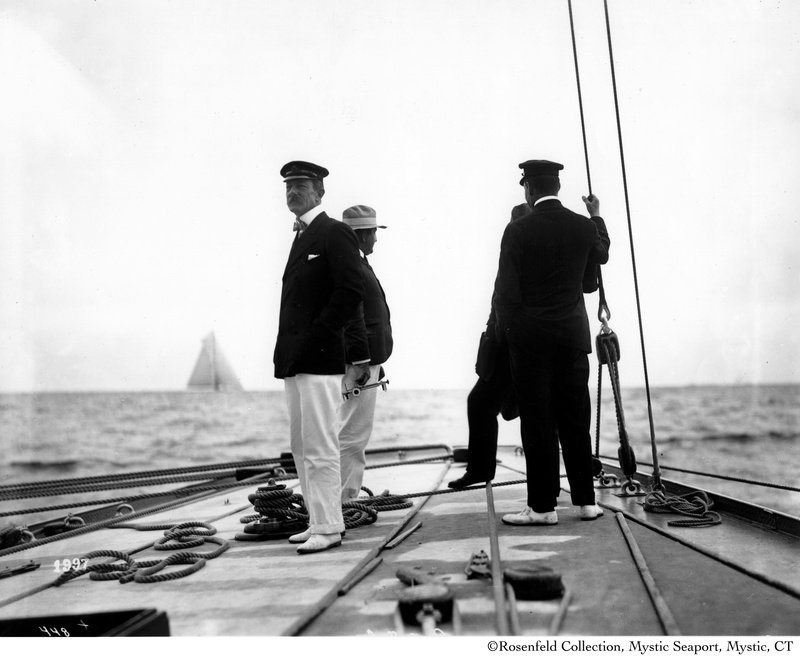 This entry was posted in Builder's Notes & Pictures and tagged America's Cup, Bristol, building 28, Capt. Barr, casting, engineer, Hart Collection, Herreshoff, Herreshoff Marine Museum, HMCo, marine museum, mast, Mike Mirman, MIT, model, model making, museum, Nat, NYYC, RELIANCE, RELIANCE Project, RELIANCE Project team, Reliance research, Rhode Island, Sandy Lee, the reliance project on September 9, 2014 by Herreshoff Marine Museum/America's Cup Hall of Fame. Mike Mirman, Steve Siosk, Tim Horton, Sandy Lee, Keith Bradley, Joe Uzzo, Herb Luther and Bill Lawton. We had a great work session – after catching up on all the holiday happenings and telling sea stories. 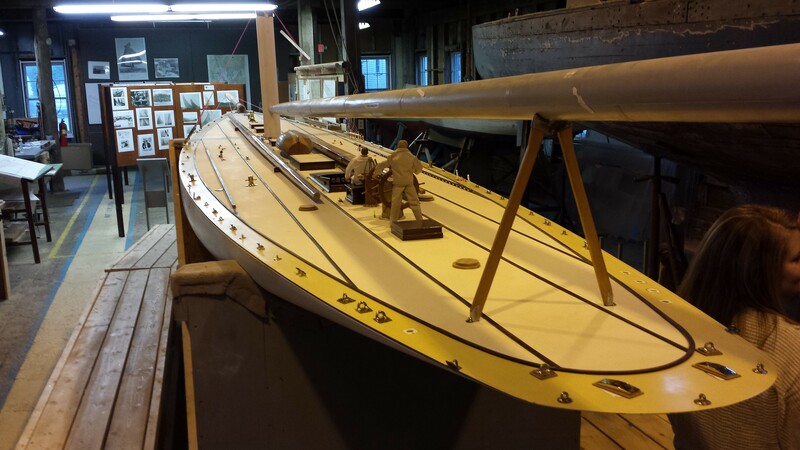 If you look on the fore-deck, you’ll see the incredible dolphin striker assembly, bowsprit spreader sockets and hawse pipe lips that Mike Mirman just delivered. We’ll be getting these in place over the next month. 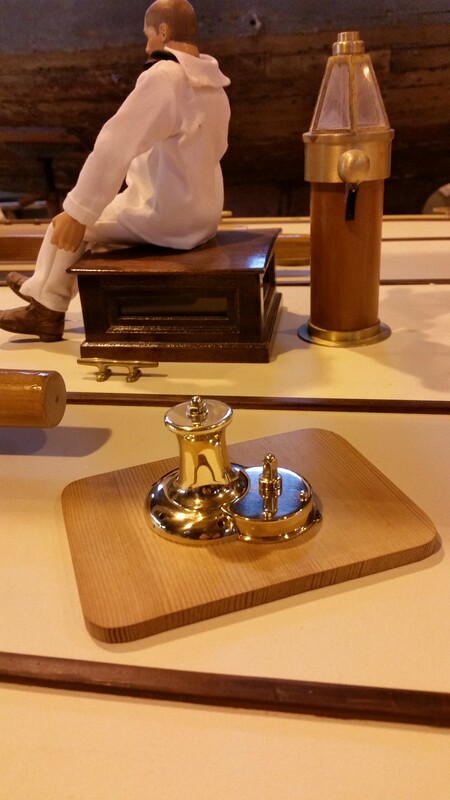 You may also have noted that six mahogany stained hatches and the companionway are on deck. RELIANCE’s furniture was butternut and from the pictures stained a mahogany color and then varnished. Joe Uzzo delivered the stained structures, and we worked with him to perfect our technique to attach the canvas tops. 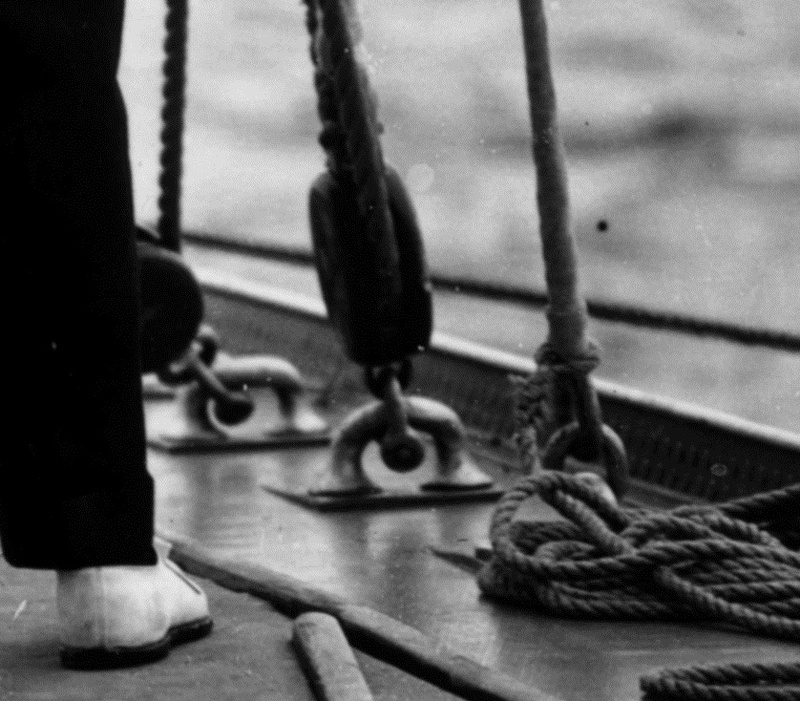 The companionway has a sliding top and glass portholes. 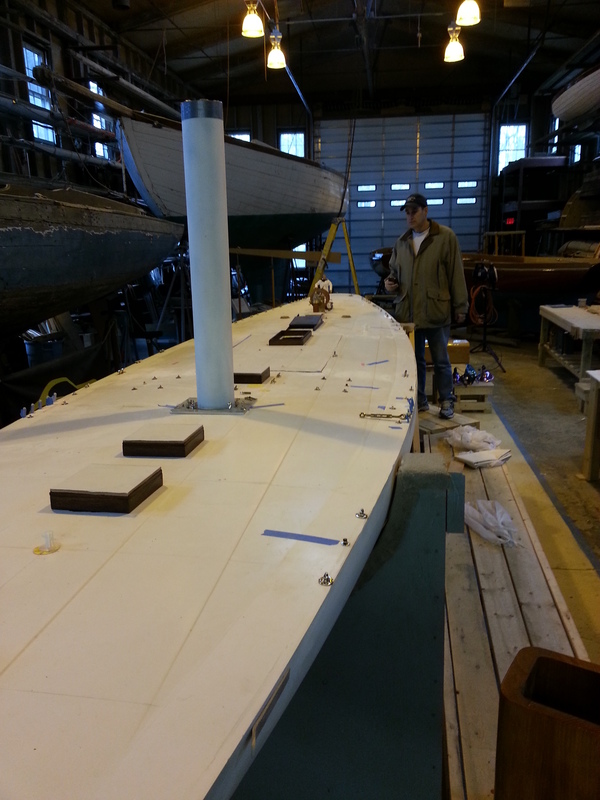 Joe is working to add the barometer, clock and race card which rest on a ledge in the companionway. 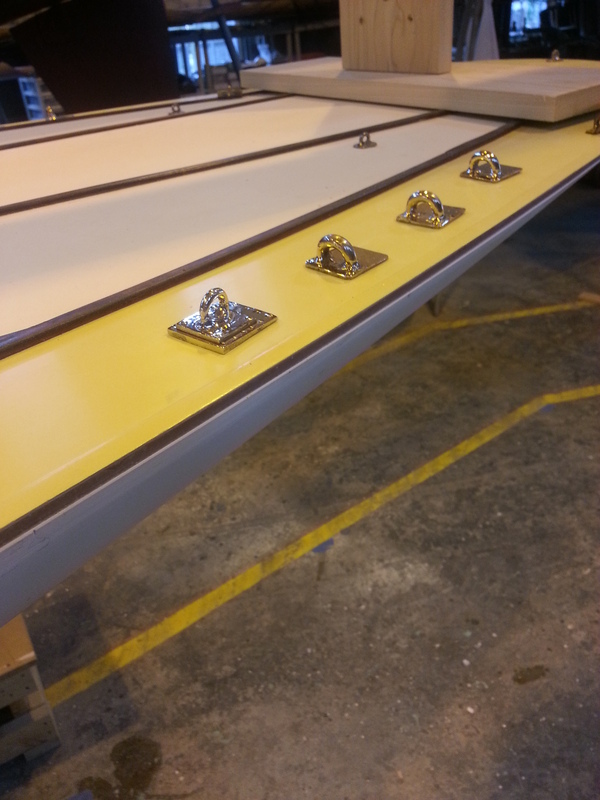 Still to go are the monitor and large two piece hatch cover. Above: Joe and his work. Below: Steve admiring Joe’s work. 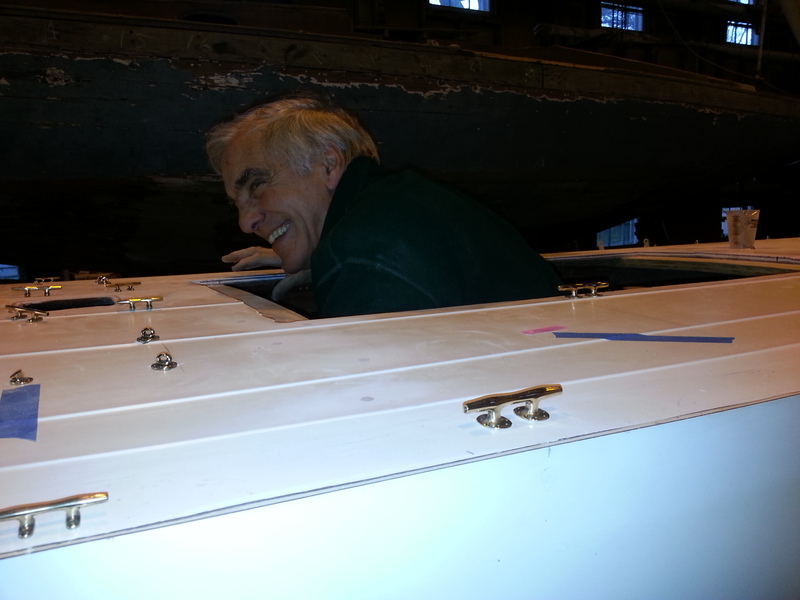 Keith has been working inside RELIANCE to adjust the mast step to her rake. 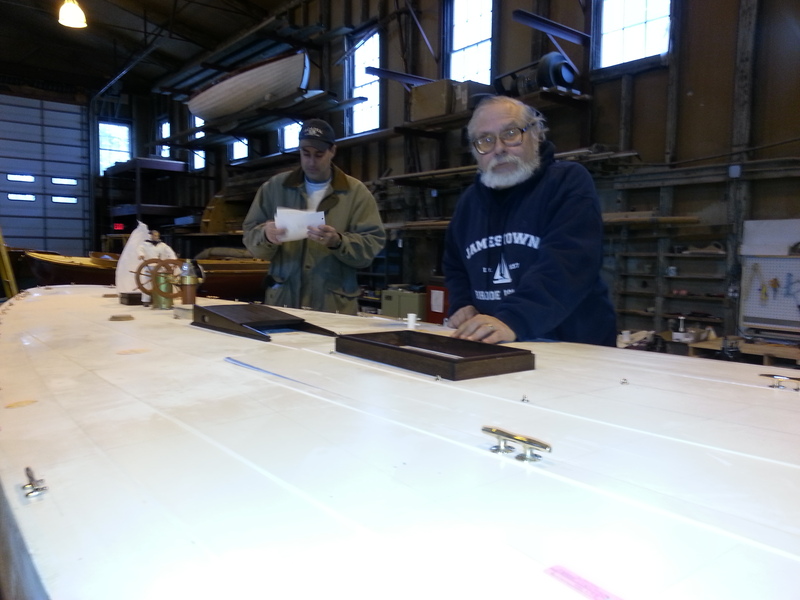 He’s also been making a metal display stand for our 2′ long 14″ diameter solid bowsprit replica while Herb Luther finishes shaping it and preparing it for varnish. 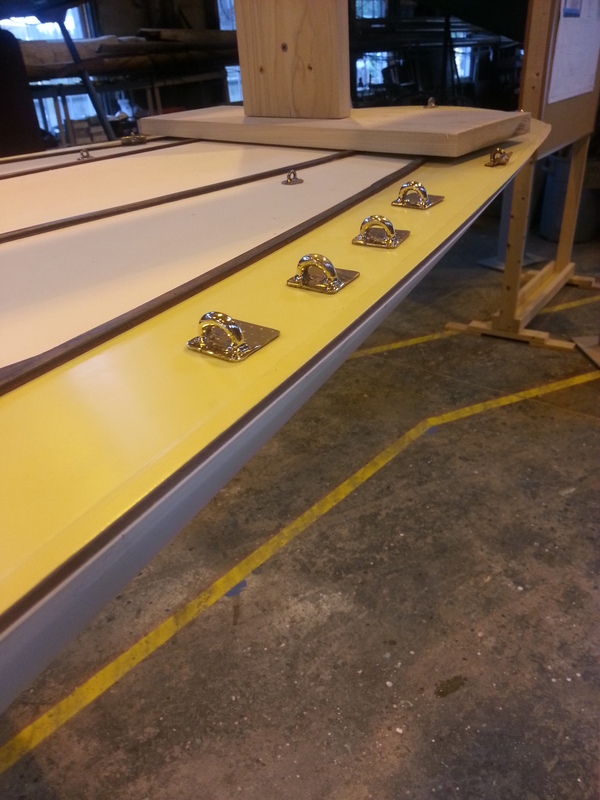 We’re also preparing plans for laying cork on the deck, attaching the fittings and painting. We’ll talk about that soon. 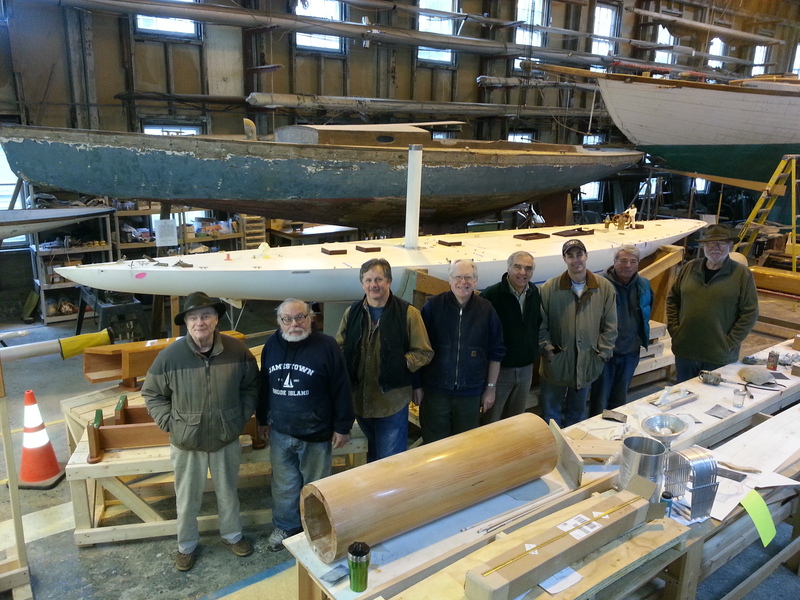 This entry was posted in Project Manager's Welcome and tagged bowsprit spreader, companionway, dolphin striker assembly, hatches, hawse pipe lines, Joe Uzzo, Keith Bradley, RELIANCE Project team, Steve Siok on January 14, 2014 by Herreshoff Marine Museum/America's Cup Hall of Fame.